After installing Silverlight 4 my XAML files never use to open. Visual Studio 2010 crashes saying Restart or Close. After bit research on net I found the following solution. 3. Take System.Windows.dllfrom path above and register in the GAC. 2. 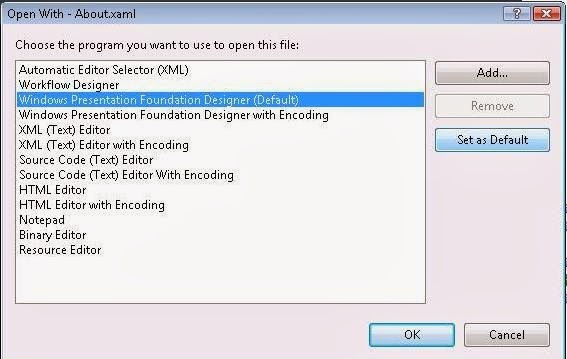 Right click the XAML file and select “Open With..” from the menu. 3. 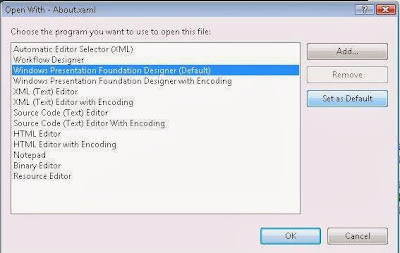 Ensure the “Windows Presentation Foundation Designer “ is set as default. Hope this will save lot of people’s day! The above things are not working for me.